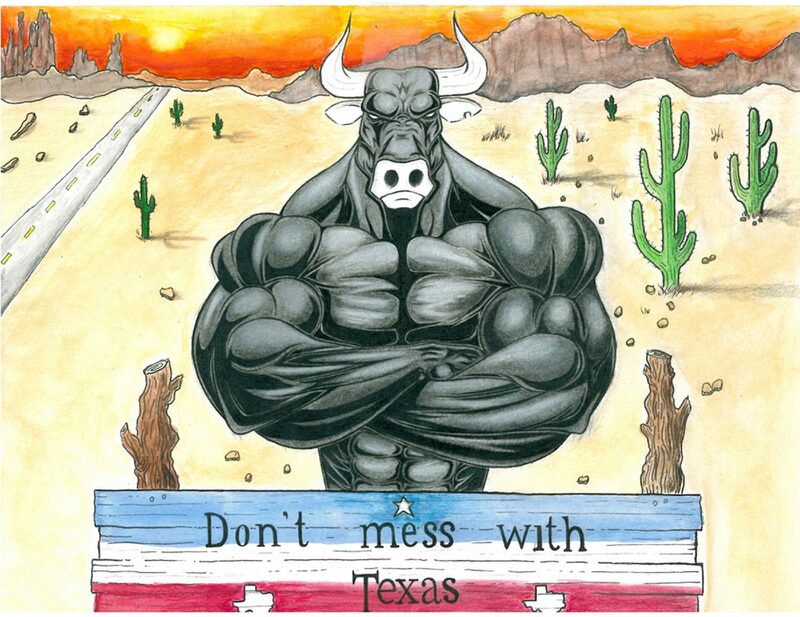 Third-place winner of the Don’t mess with Texas K-12 Art Contest was an entry submitted by Edinburg North High School art student Edgar Leal. EDINBURG — Keep Texas Beautiful and the Texas Department of Transportation recently selected a student from the Edinburg school district as one of the winners of its annual Don’t mess with Texas K-12 Art Contest. 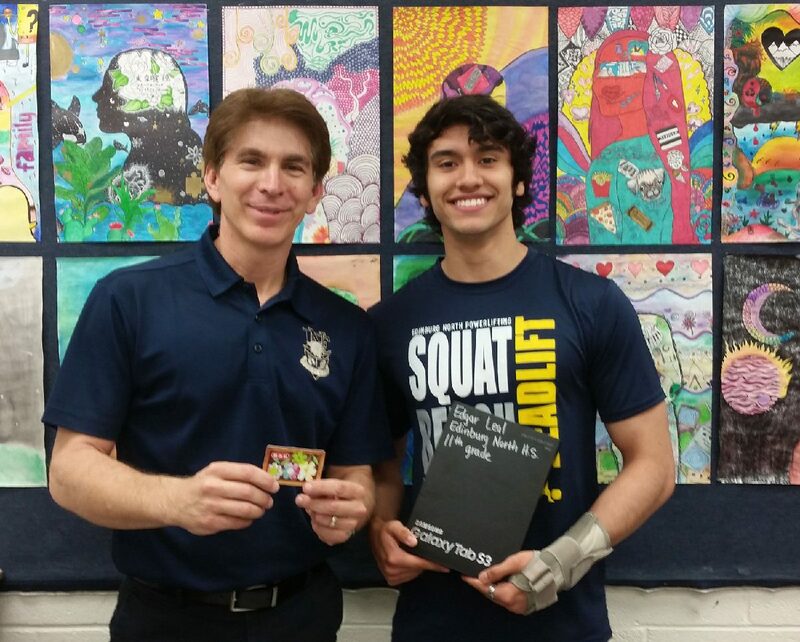 Edgar Leal, an 11th-grade student at Edinburg North High School, placed third out of 3,793 students who submitted entries from 308 schools throughout Texas. Leal said that he felt inspired when creating his artwork, which featured a muscular bull. “A Texas bull came to mind, because nothing says don’t mess with Texas than a big muscular guy,” he said. Edinburg North High School art student Edgar Leal, right, holds a Samsung tablet he was awarded in the Don’t mess with Texas K-12 Art Contest and his art teacher, Manuel Saenz Jr., left, holds an H-E-B/Central Market gift card he received as part of the contest. According to Keep Texas Beautiful, the 13 winning designs will be showcased in the 2019 Don’t mess with Texas calendar and will be highlighted on the Don’t mess with Texas and Keep Texas Beautiful websites. The students’ artwork will also be featured at the 2018 Keep Texas Beautiful annual conference this month. Leal and each of the winners received a Samsung Galaxy tablet donated by Samsung. The teacher who rep-resented each of the winning students received a $100 H-E-B/Central Market gift card. Saenz said that he was very pleased with the outcomes of all of his students, especially since it was the first time Edinburg North participated in this annual competition. The contest, which is open to kindergarten through 12th-grade students, is a joint effort by Keep Texas Beautiful and the Texas Department of Transportation to encourage young Texans to keep Texas roadways and the environment clean and free of litter. More information, including how to request your free 2018 or upcoming 2019 calendar is available at https://ktb.org/artcontest.